In addition to equipment, we also undertake design, detailed engineering and fabrication of Storage Tanks for various Industrial Sectors, we are also well versed with “Onsite Fabrication of Tanks and Silos. Backed by our adroit team of professionals, we are able to provide our clients with an assorted gamut of Aluminium Storage Tank. Enriched by our vast industrial experience in this business, we are involved in offering an enormous quality range of Aluminium Storage Tank. 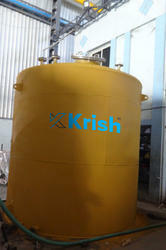 we are manufacturer of aluminium storage tank for chemical storage of nitric acid storage. We hold specialization in offering both huge and small sized Aluminum Fabrication Tanks. Our engineers and technicians work upon the specifications given by the clients. These tanks are corrosion resistant and are light in weight. Keeping in mind the precise demands of clients, we offer a wide range of Aluminum Storage Tank. These are engineered from top quality components which ensure its maximum durability and robustness. Demands of our tanks are increasing day by day owing to its rough and tough usage and high durability. xG&P is one of the leading storage solutions provider for dry and liquid i.e. raw water, portable water and covers in association with international manufacturer.